Purolite MZ10 Plus is an iron removal media that removes soluble Iron, Manganese, Hydrogen Sulfide, Arsenic and Radium from water supplies. In addition to its catalytic property, it also facilitates the redox reaction of Iron and Manganese. Purolite MZ10 Plus effectively removes Iron, Manganese and Hydrogen Sulfide from natural waters. It can even be used at high operating temperatures and differential pressures without breakdown of the media. Unlike other medias, it does not require extensive pre-conditioning. PUROLITE MZ 10 is a Manganese Zeolite, an oxidizing and filtering medium, prepared by processing Glauconite, a natural product, better known as “greensand”. PUROLITE MZ 10 effectively removes from natural waters Iron, Manganese, Hydrogen Sulfide, which are of particular concern because very small amounts of any one in a water supply can seriously limit its usefulness. Water for industrial and domestic uses must be iron and manganese free. In many countries, for municipal use, iron content cannot exceed 0.2 ppm and manganese 0.05 ppm, but they should preferably be less than 0.05 and 0.02 ppm respectively. In certain industries like pulp and paper mills, tanneries and textile plants, dye houses and laundrys, it is almost impossible to operate with Iron or Manganese bearing waters since they would produce objectionable stains, streaks, spots and off-colours on many manufactured products. Iron and Manganese also foul ion exchange resins which necessitate their removal as pretreatment to most ion exchange processes. PUROLITE MZ 10 is a quite versatile product that, used in conjunction with Potassium Permanganate, thanks to its catalytic properties, can reduce Iron and Manganese in water supplies to extremely low levels. None of procedures such as aeration, chlorination and filtration can yield an effluent with the same quality as obtained with the use of PUROLITE MZ 10. PUROLITE MZ 10 has a few unique characteristics in addition to its catalytic property that provides the maximum utilization of the oxidizing agent used, such as Potassium Permanganate, Chlorine or dissolved Oxygen, which results in increasing both the rate and the completeness of the oxidation reaction. Its oxidation reduction buffered capacity, for instance, governs the length of the operating cycle on the discontinuous process and permits a safe and smooth operation when it applies to the continuous process. 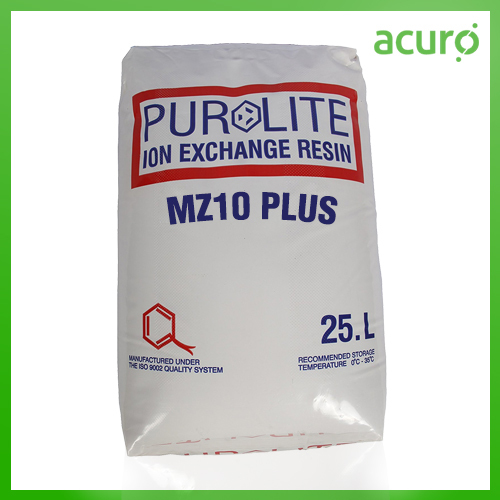 Just as ion exchange resins have the capacity to exchange ions, so PUROLITE MZ 10 has the capacity to exchange electrons. This means that it can oxidize iron or manganese until the supply of electrons becomes depleted. These electrons may be replaced continuously or discontinuously by the addition of an oxidizing chemical such as potassium permanganate. The nodular shape and the fine size of the granules, together with their ruggedness and durability, afford excellent filtration efficiency, even after years of continuous service. Backwash the PUROLITE MZ 10 bed with water at a minimum linear flow rate of 30 m/h (m3/h/m2) for 15 to 20 minutes or, if available, with air and water. Regenerate the PUROLITE MZ10 bed with potassium permanganate using a regenerant level of 3 g of KMnO4 per litre of zeolite, slowly passing a 0.3% solution through the bed in 30 minutes. Displace the regenerant solution with 1 BV of water in 30 minutes. Rinse with 5 to 6 BV of water at the service flow rate, check the absence of potassium permanganate in the effluent and start the service run. How Purolite Mz 10 Works? PUROLITE MZ 10 is employed following two basic application techniques, the choice of which depends primarily on the level and relative amounts of iron and manganese existing in the water to be treated. When iron removal is the primary objective, generally the continuous technique is applied. On the other hand, when the removal of manganese is the primary goal, the discontinuous technique is employed. Mixed techniques can be used for large units when both iron and manganese must be reduced to very low levels. The reaction in the removal of manganese is that PUROLITE MZ 10 oxidizes the manganese salts in the water to a higher insoluble oxide and, at the same time, the higher oxides which constitute the Manganese Zeolite coating are reduced to a lower insoluble oxide. After a specified quantity of raw water has been treated, or, in other words, after the oxidation 3 capacity is exhausted, the PUROLITE MZ 10 bed is regenerated with Potassium Permanganate. This step returns all the lower manganese oxides to the higher oxides and the cycle begins again. A similar reaction occurs in the removal of iron, with the difference that the ferrous ions are turned into ferric hydroxides, which are then filtered out by the bed. While the discontinuous system involves periodic regenerations with potassium permanganate the continuous system requires constant addition of Potassium Permanganate and/or other oxidizing chemicals directly into the water ahead of the PUROLITE MZ 10 filter. The discontinuous process sequence is: backwash, regeneration with a dilute solution of potassium permanganate, rinse and return to service, all requiring about one hour. Treated water is recommended for backwashing unless the iron and manganese in the raw water are very low. To maintain the bed in a clean condition, occasional air-water washes are recommended. The continuous process sequence is: backwash, rinse, and return to service, all requiring about 20 minutes. When backwashing with treated water, this rinse may be unnecessary. Pressure drop of a fluid passing through a fixed bed of any granular filter medium is related to the service flow rate, and to the viscosity and the temperature of the fluid. Typical values of pressure drop for PUROLITE MZ 10 are found in the figure below. PUROLITE MZ 10 is a pretty heavy product and requires important backwash flow rates to expand the bed and free it up from any particulate matter (mostly iron hydroxides) filtered out during the service run. To be effective, the backwash flow rate must expand the bed by a minimum of 35 to 40% for 10 to 20 minutes or until the effluent is clear. The proper backwash flow rate can be determined using the figure below. Low pressure compressed air applied prior to backwash with water can help loosening the PUROLITE MZ 10 bed. The discontinuous process shall be used when both iron and manganese need to be removed, or whenever a minimum residual manganese concentration in the treated water is to be guaranteed. PUROLITE MZ 10 is in this case regenerated with a fixed amount of potassium permanganate when the specified quantity of water has been treated. This technique is so simple, safe and effective that it is widely used for household applications as well as for large industrial water treatment units.